Although the correlation is clear when you visually inspect the two maps, I thought it would be interesting to directly visualize that correlation. 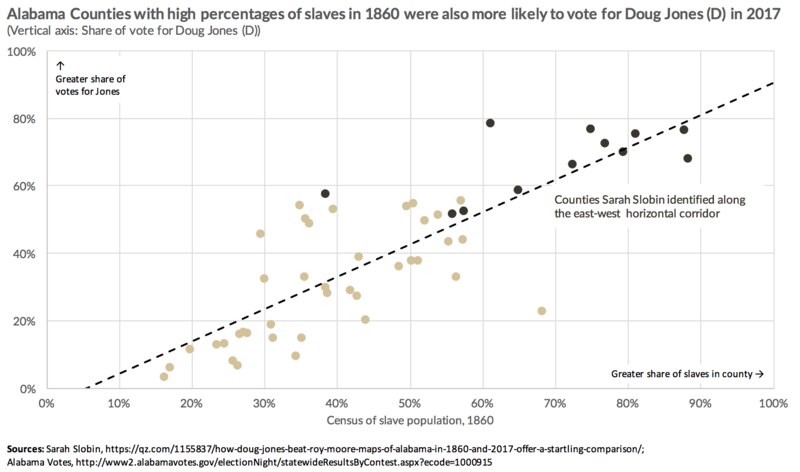 Sarah sent me the website with the vote totals, and I visually pulled the numbers out of the slave map. I calculated the share of the vote going to the Democrat in the 67 counties with vote totals in the recent election, which range from 16.1% to 88.1%. I then identified 51 counties in the slave map on the left with percentages of slaves, and which range from 3.1% to 78.3%. 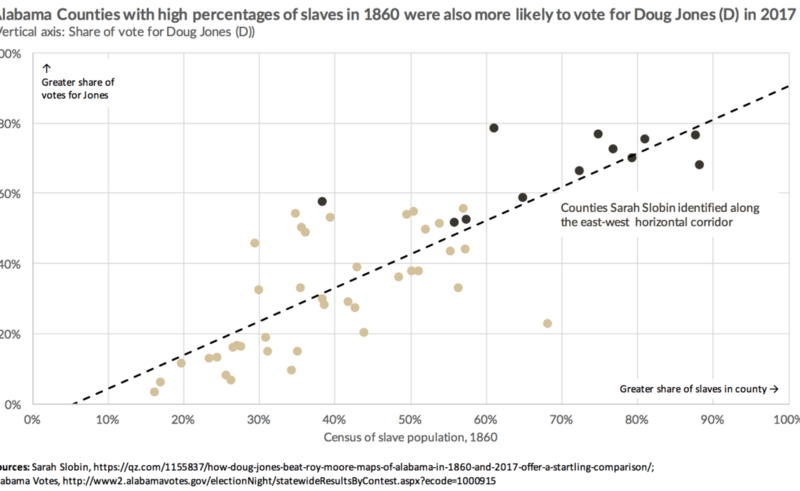 (Excuse some of the missing data here; I haven’t gone through Alabama history to figure out how counties changed, merged, or broke up in the last 150 years.) Plotting these two variables in a scatterplot quickly shows the positive relationship between the two with the (darker) circles in the top-right part of the graph marking those 12 counties along the east-west corridor. I wouldn’t really call this a “remake” because Slobin’s map pairing is really quite striking. It’s probably even more meaningful for people who live in Alabama. If you want to play around with the data, here’s my Excel file.